Building on from this morning’s Q&A with Sue Blacker about designing with breed-specific yarns for her book, Pure Wool and the afternoon’s tantalising glimpses of Kate Davies’ superb colour-knitting designs created with Shetland wool, this evening we shall be learning about the specific features of designing with another distinctive breed – the Lincoln Longwool. 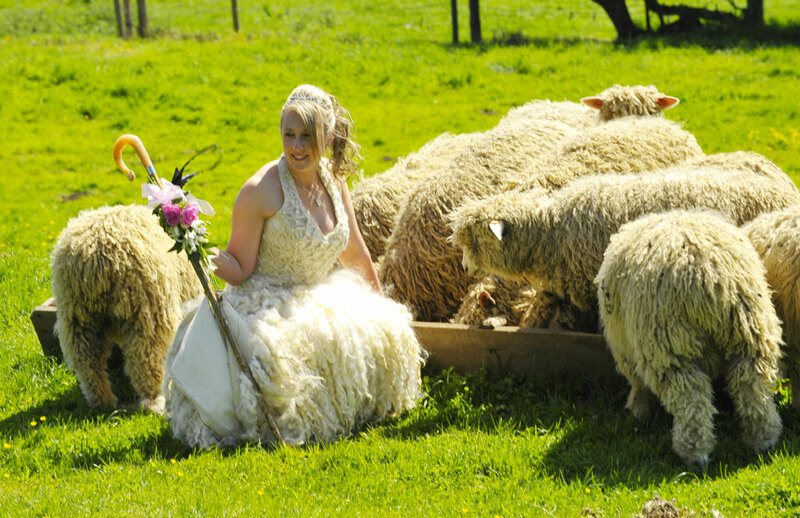 Louise Fairburn whose sheep we met during ‘Growing Wool‘ and whose wool we saw during ‘Harvesting Wool‘ utilised the wool from her sheep specifically for making a totally stunning Wedding Dress! Louise very kindly agreed to do a Q&A with WOVEMBER about working with her Lincoln Longwool flock to make this distinctive gown! 1. 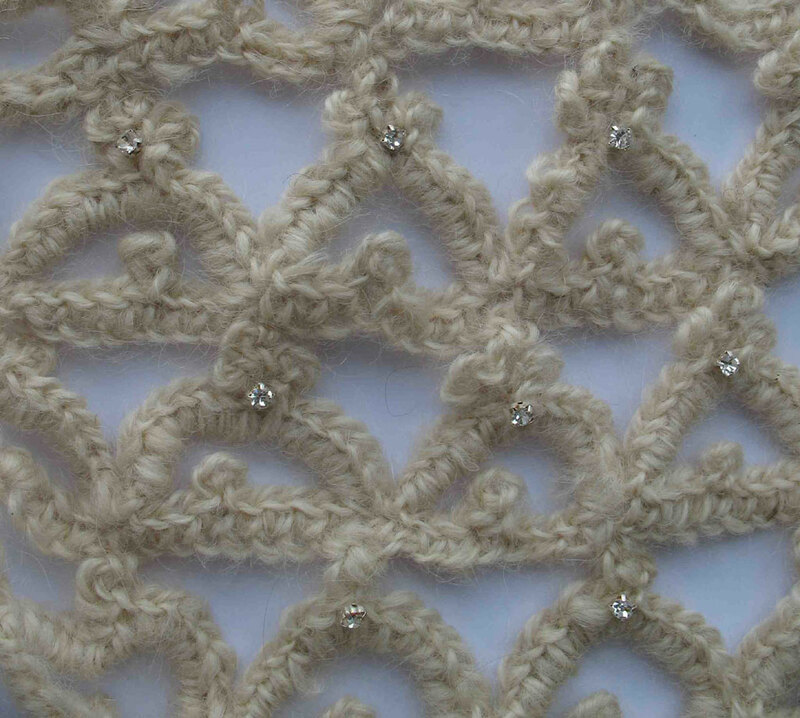 I love how you describe on your site the tactility of the washed locks of Lincoln Longwool sheep, and I wondered if you could say a bit about how these locks inspired the design for your dress? When we go out and about with our sheep they seem to amaze passers by who are magnetically drawn by their long curly locks, they gaze in wonder and ask silly questions like “does it grow like that naturally?” When I thought about designing a wool wedding dress with the ‘wow factor’ I knew it was already there in the long lustrous locks, so in many respects mother nature had already done much of the design work for me! 2. I was intrigued by a reference to Brinton’s carpet adverts of the 1990s on your website, and found this link! Are these the designs you were referring to, and do you remember when you saw them or why they made such an impression on you? Yes those are the adverts, there are a few more of them too. 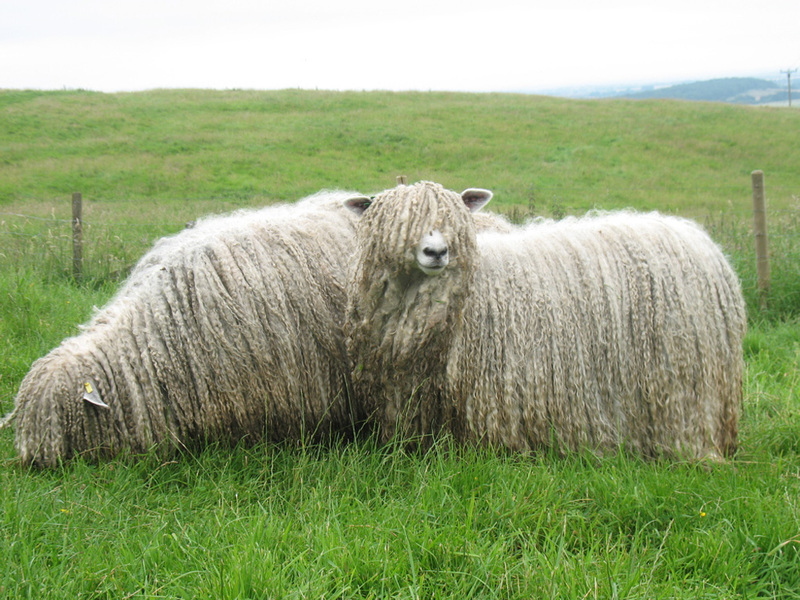 I remember marvelling over them in glossy magazines and thinking they were so beautiful and really reflected the timeless qualities of a traditional wool carpet. 3. Could you say a little bit about collaborating with a hand spinner to develop the yarn used in your Wedding Dress bodice? Did you learn anything about Lincoln Longwool from working with a hand spinner? Did the spinner give any specific insights about how to spin the fleece, and how to get the best out of the wool? From my many conversations with hand spinners I have learnt that Lincoln is a very technically challenging wool to spin, mostly on account of its length,however, once the technique is mastered it is apparently a dream fibre to work, again on account of its length. The lady who spun the wool for the bodice is an extremely experienced spinner and managed to spin it very finely to lessen the ‘chunkiness’ that would have resulted from a machine spun alternative. Also, hand spun Lincoln always tends to have a more noticeable lustre. 4. Could you explain how the vision for the dress was developed? 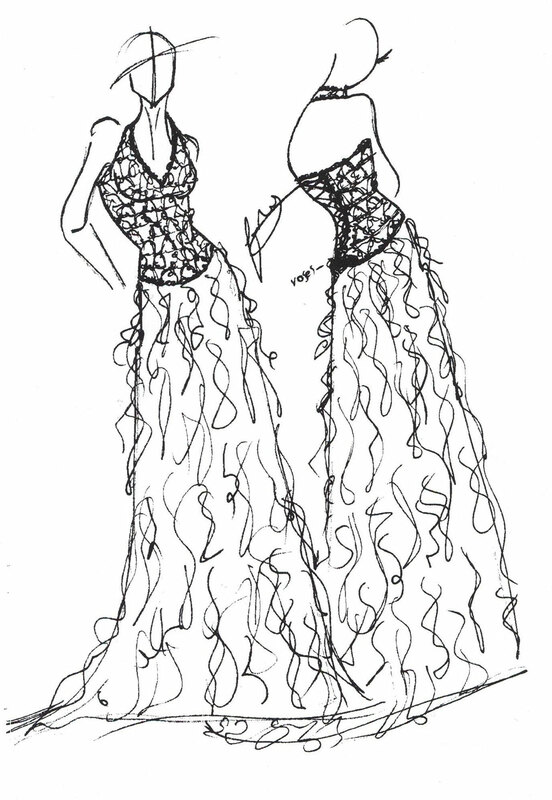 The vision for the dress developed over a very short space of time. I was inspired by some felted lincoln Longwool which the hand spinner had been working on. 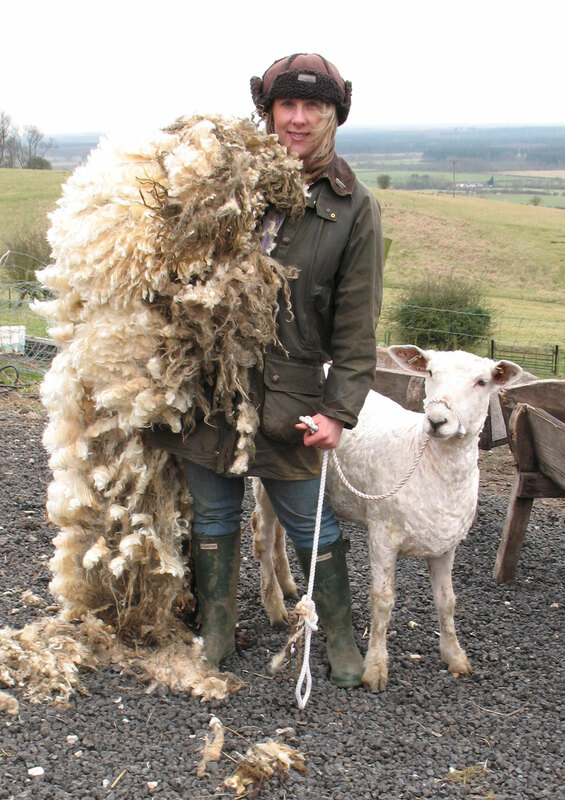 The many different ways of using the fibre inspired me to put together a full picture of the versatility of Lincoln Longwool all in one garment. I wanted the finished dress to truly reflect the magnificent breed of sheep from which the wool had been harvested. 5. 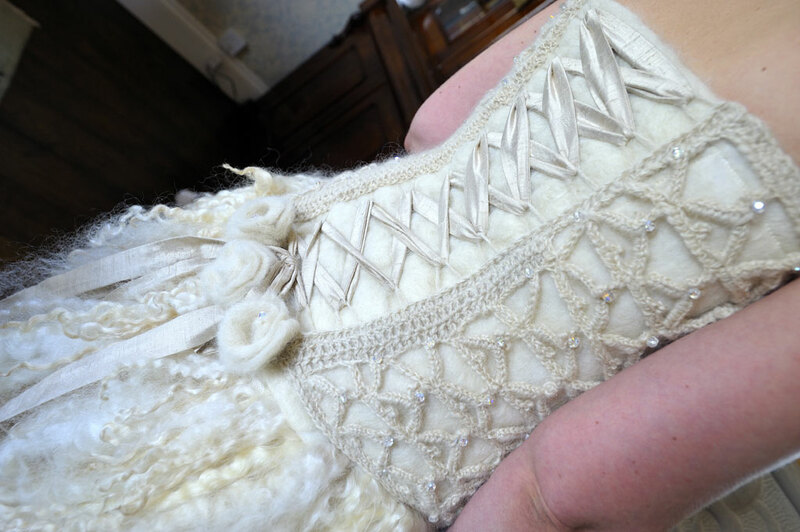 It seems to me that using hand-spun Lincoln Longwool in a crocheted pattern has given you a flexible, but gently-structured fabric – rather like the woollen equivalent of soft corsetry? I expect it is more comfortable than an actual corset, though! What is the dress like to wear? Despite popular misconception the dress was extremely comfortable to wear. Although the dress is heavy, once adorned the weight is evenly spread and not at all noticeable. I also didn’t feel the heat as the dress just deflected the suns rays in much a similar way that it would protect and self-regulate the sheep in the field. 6. I am really interested in the structure of the skirt of your dress; could you explain how you have achieved that beautiful, expressive, flowing skirt of sheep-locks? The skirt was made from a light woven Lincoln Longwool cloth. The staples of wool were sewn directly onto this in layers. The layering replicated just how they would naturally hang on the sheep. 7. 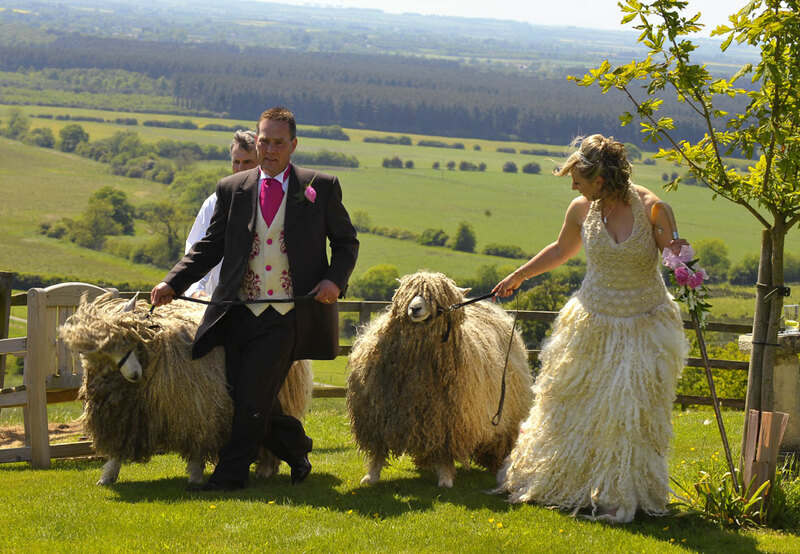 What are some of the other uses of wool that you integrated into your Wedding? The felted wool was used for the groom’s waistcoat and also for an embroidered panel which made an interesting contrast to the silk bridesmaid’s dress. 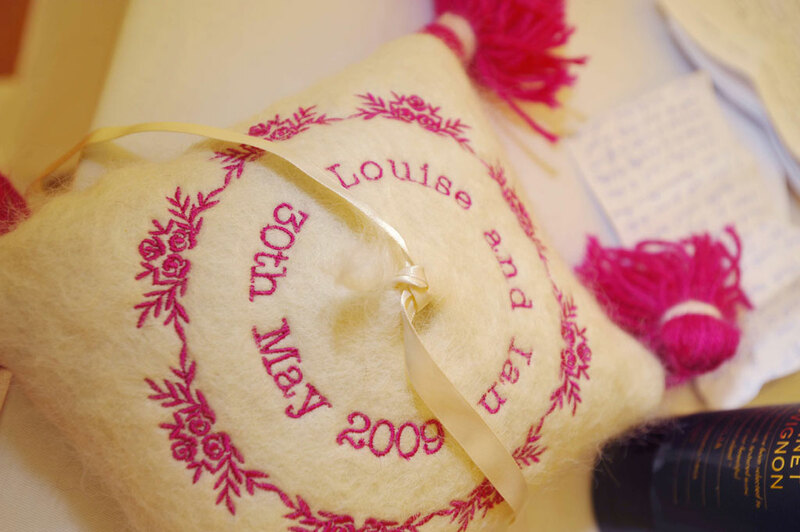 A ring cushion made an attractive addition to the ceremony. 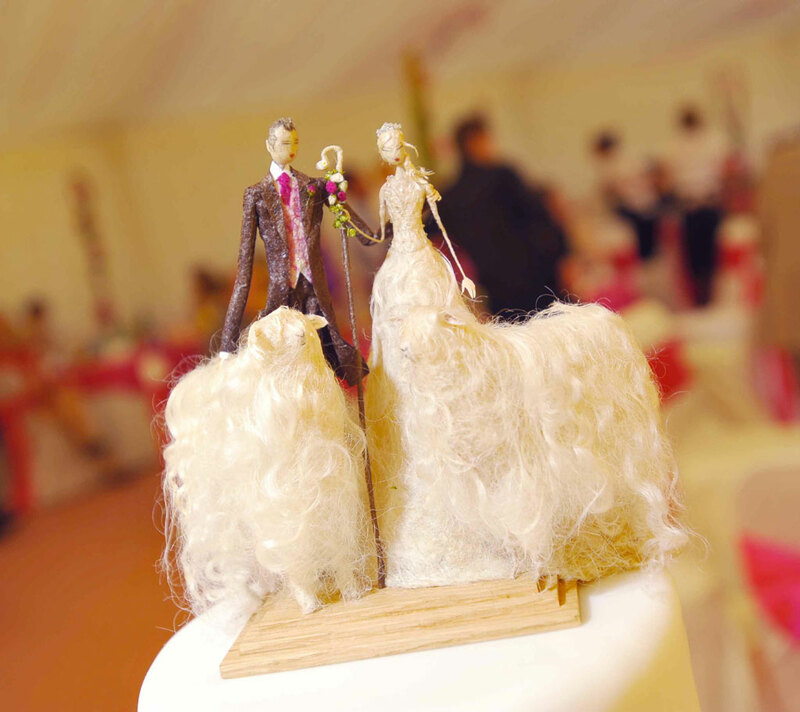 Lambswool fibres were used to build a unique cake topper, which represented the Bride & Bridegroom, their woolly attire and their woolly companions!